Posted on Fri, Mar 9, 2012 : 10:50 a.m. When everything began to reach a low point this season, Tim Hardaway Jr. did what his instinct told him to. He shelled up and tried to go it alone. And he may as well have been fighting through quick sand. "I was just trying to deal with it in my own head," the Michigan basketball sophomore said. "And that was bad on my part, because it brought my game down to a whole other level." In his last game against Minnesota, Tim Hardaway Jr. was in the midst of a slump and made 2 of 14 shots. Michigan faces the Golden Gophers again Friday in a Big Ten Tournament quarterfinal. After putting up 26 points on 11-of-18 shooting in Michigan's Big Ten-opening win over Penn State in December, everything about Hardaway's game looked like it would be just fine moving forward. But when the calendar turned, Hardaway's shot -- and his confidence -- began to unravel. Michigan survived, but it did so in spite of its best wing fighting through the worst slump of his career all by himself. And the stats certainly told the story. Against Minnesota he was 2-for-14, 0-for-4 from deep. In a loss at Indiana he took seven 3-pointers and missed them all. The next week at Iowa, he went 2-for-13, and clanged every one of his eight long balls. He seemed to figure things out in late January at Purdue, going 8-for-15 with 19 points in Michigan's first Big Ten road win, but was back on the mat again a week later, going 4-for-14 against Indiana before putting together the biggest clunker of his young career at Michigan State. Against the Spartans on Feb. 5, the player who was supposed to be Michigan's unquestioned go-to scorer went 1-for-10 from the field and 0-for-3 from 3-point range, finishing with just four points in a 10-point loss. From Jan. 1 to Feb. 5, Hardaway was an abysmal 46-for-137 from the field (33.5 percent), 14-for-63 from 3-point range (22.2 percent). "It was very tough," he said of his slump. "Just not seeing the ball go in the basket and not really listening to nobody, just trying to fix it on my own. "I felt like if I fixed it on my own, it would get better, and it didn't." Left with no other choice, Hardaway eventually came out of his shell and began to look for help. He spent time with Michigan Director of Athletic Counseling Greg Harden, a man former Wolverine football greats like Desmond Howard and Tom Brady have sworn by. He began to take a look at the mental part of his game, analyzing it as much as any jump shot or free throw mechanic. From there, he began to fully accept help from teammates and coaches, finally coming to the realization that he can't win -- or lose -- games on his own. "He's had tough stretches, but he's bounced back," Michigan senior co-captain Stu Douglass said. "We try to instill that every single day. Tell him to keep taking shots, or tell him 'maybe that wasn't such a great shot.' Just having honest confidence in him. And it's paid off. "A lot of it has a lot to do with him and his self-talk. You just have to keep encouraging him." Of late, Hardaway's played with more confidence, but he's also simplified everything. Finally listening to coach John Beilein's advice of finding "the best shot, not necessarily the first shot," Hardaway put in a masterful performance at Illinois earlier this month, scoring 25 points on 6-for-7 shooting, while also grabbing 11 rebounds. He didn't miss a 3-pointer, he only missed one field goal and went 9-for-10 from the foul line. A nearly perfect performance. "He's just a special young man that really is growing every day at not being so hard of himself," Beilein said. "His care level is so high, that it can be a negative. "He certainly enhances our ability to win against very good teams." Hardaway finished the regular season with a 13-point performance at Penn State, including the game-sealing 15-footer in the closing minute. With Michigan prepping to begin Big Ten Tournament play Friday (6:30 p.m., BTN), Hardaway seems to be in his best mental state of the season. He's not trying to do too much, he's not doing too little and, more importantly, he's not trying to do it alone anymore. "(I've been) just coming out the last six or seven games just trying to play hard and play more aggressive, and I think that just helped us out as a team," Hardaway said. "For me, you could have the worst day, but when the clock's boiling down, as long as you make that last shot, (nothing) matters anymore. "You're coming home with a win." Mon, Mar 12, 2012 : 1:13 a.m. Shut down Burke...beat the Walverines! Hardaway...LOL! Sat, Mar 10, 2012 : 8:10 a.m.
Go get them buckeyes tim. Bring them back dwn to earth for us. 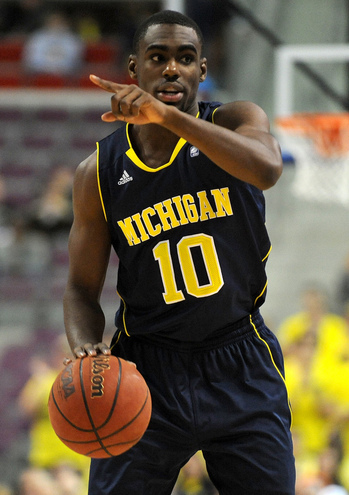 Fri, Mar 9, 2012 : 7:04 p.m.
You hang in there, Tim Hardaway, Jr. The people that matter have always got your back. Fri, Mar 9, 2012 : 6:05 p.m. The funk this team seemed to be in most of this season revolves around this article. When your &quot;best player&quot; is still learning to be a team player, it can wear the team out. If he brings a good mental attitude, and plays well, this team is significantly better! Fri, Mar 9, 2012 : 10:21 p.m. If this team was ever in a &quot;funk&quot; this season I must have missed it. There were individual players that struggled at times, but this team never even lost two games in a row. I think you have to lose consecutive games before you're in any kind of &quot;funk&quot;. I thought these kids responded well. If a key player was struggling, someone else would step up to fill in the gap.